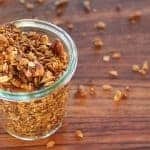 Pumpkin Spice Seedy Slow Cooker Granola is an easy, healthy pumpkin recipe that smells like all things cozy. In the kitchen, at the table and nearly every restaurant menu, pumpkin, cinnamon, and ginger are flavors of the season. It used to be pumpkin was a seasonal pie. But, OMGosh, now pumpkin is everywhere! This hot, hot food is in yogurt, almonds, ice cream, cereal, cakes, peanut butter, cookies and muffins, plus coffee drinks and beer are showcasing pumpkin and the spicy seasonings that pair so well with it. Cooked pumpkin, rich in vitamin A and a good source of fiber, is good for your digestion, skin, eyes, and blood pressure. All its orangey goodness brings plentiful plant compounds making pumpkin a vegetable not to be missed. The spices we tend to use with it also deliver health benefits, so it’s a win-win for your taste buds and your body. Unfortunately, some of pumpkiny foods listed above don’t have any pumpkin. I’m looking at you Pumpkin Spice Oreo’s! Canned pumpkin is a staple in my cupboard. Almost like a little black dress, it goes with about everything! It’s delish as a ravioli sauce. Or stirred in pancakes, oatmeal, soups, chili, smoothies, and yogurt. You might like my lower sugar pumpkin recipe for Gingersnap Pumpkin Pie. Some recipes don’t require a full can of pumpkin but that’s OK. Leftover canned pumpkin can be frozen in an airtight container, or here’s what you can do with leftover pumpkin. stir into 3 cups of your favorite spaghetti sauce. mix into each cup of mashed potatoes. substitute pumpkin for all the butter in mac and cheese. add pumpkin to a package of corn muffin mix batter. blend into 1 ½-cups or a can of chili. 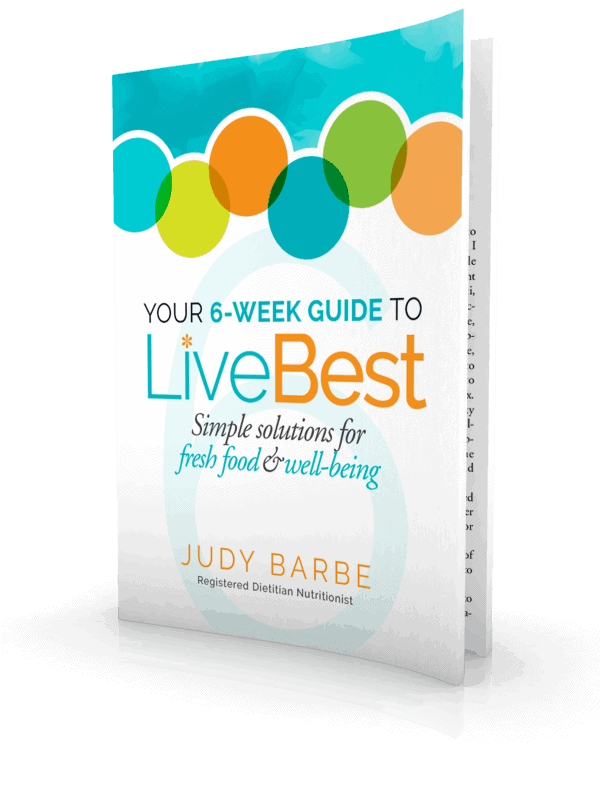 for each cup of uncooked rice add ½-cup pumpkin to the cooking water or broth. stir pumpkin into 1 cup (about 7 oz. container) of hummus. mix into a cup of yogurt. The spices used in Pumpkin Pie Spice are fairly common, so to save room in your spice rack, you might want to mix your own easy-as-pie pumpkin pie spice blend. 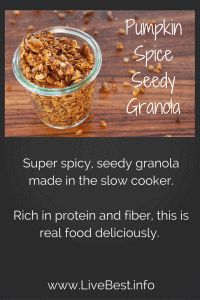 Because I’m adding more fiber to about everything I make (see High Five Fiber Challenge), I made over my Ginger Orange Granola recipe with lots more seeds, quinoa and canned pumpkin for more fiber and protein. Plus it smells like a cozy home should smell like when it’s baking! Since you have all these seeds and nuts, you might like Apricot Pecan Crisps. This granola has a lot of spices. You may omit some if you don’t have them on hand. You could also substitute 3 teaspoons of pumpkin spices for all the aromatic spices. I made this in a slow cooker. I cooked it on 4 (5 being High), with the lid offset so steam could escape. I stirred it every 40 minutes or so to make sure it wasn’t burning on the bottom. Then I spread it on a baking sheet to cool before storing. If you prefer, bake at 300°F for 2 hours, stirring every 30 minutes. Slow cooker temperatures vary widely, so keep an eye on yours. 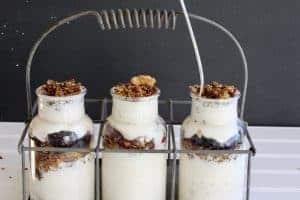 These Weck jars are perfect for granola storage, to eat from or to give a granola gift. Pin it for later. Or rate it below, please! Mix: all ingredients in a slow cooker. Stir well. A rubber scraper or wooden spoon is best for a non-stick coated slow cooker. Cook: Turn slow cooker heat to medium high. Place lid so that it is slightly off center. This allows steam to escape. Cook for 2 hours, stirring every 30 minutes. 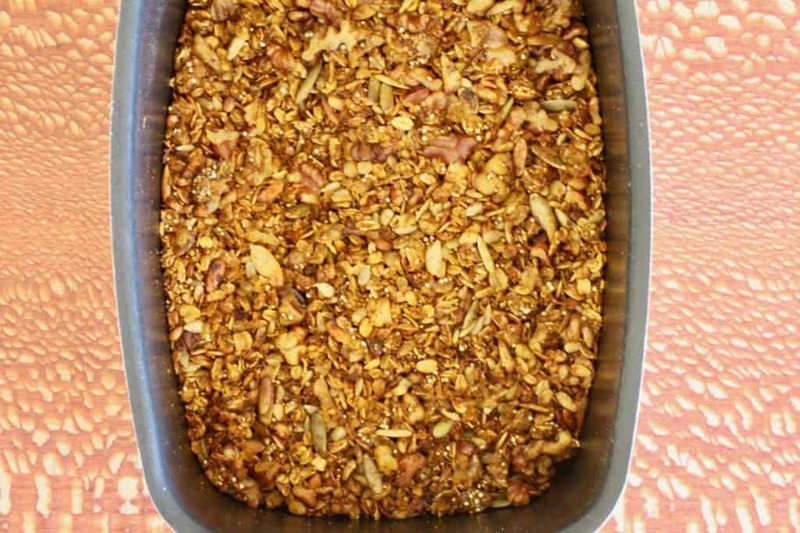 Remove granola from slow cooker to a baking sheet or waxed paper. Allow to cool. Optional: Add dried cranberries, raisins, figs, apricots, or coconut. Use a combination or just what you like. This recipe has a lot of spices. You may omit some if you don’t have them on hand. You could also substitute 3 teaspoons of pumpkin spice for all the aromatic spices. This recipe is made in a slow cooker, but you can bake it on a sheet pan at 300° F. for 2 hours, stirring every 30 minutes. My slow cooker is nearly vintage, but a West Bend something like this. I also use it to make yogurt. 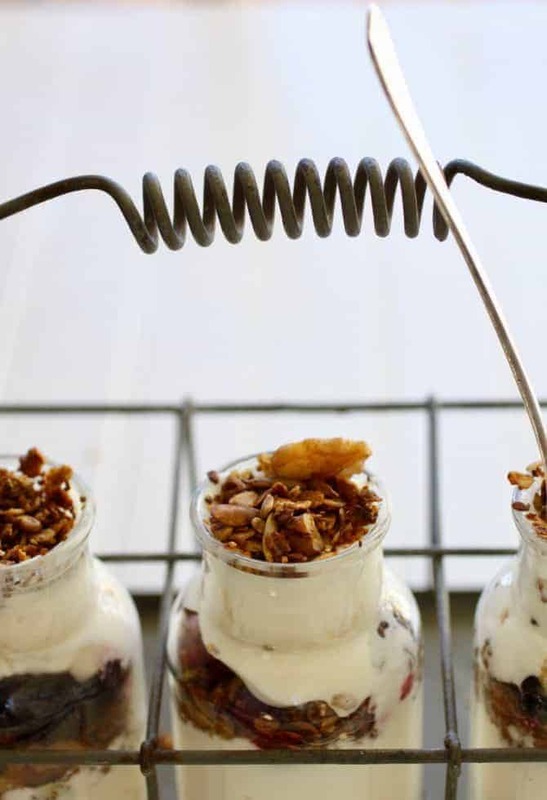 In addition to yogurt, Weck jars I store honey and jam in Weck jars. Pingback: Recipe Roundup: 18 Crockpot and Instant Pot Recipes to Keep You Sane Throughout the Week - Noom Inc. | Noom Inc.